John Elkington has worked for forty years in the environmental, sustainability, and social innovation fields. He has cofounded four companies, sits on more than twenty boards or advisory boards, and is a founding advisor of The B Team advisory board. He is the author or coauthor of nineteen books, including The Power of Unreasonable People. He has received awards from the UN, the Skoll Foundation, Fast Company, the Rockefeller Foundation, and others. John lives in London. Jochen Zeitz is cofounder and cochairman of The B Team. He is a director at Kering (formerly PPR) and chairman of the board's sustainable development committee, after having been CEO of the Sport & Lifestyle division and chief sustainability officer (CSO). Previously, he served eighteen years as chairman and CEO of Puma. He was the youngest CEO in German history to head a public company. He is a board member of Harley-Davidson and Wilderness Safaris and is coauthor of The Manager and the Monk (Jossey-Bass, 2012), which has appeared in fifteen languages. Among other awards, he was named the Financial Times Strategist of the Year three years in a row. Jochen lives in Switzerland and Kenya. 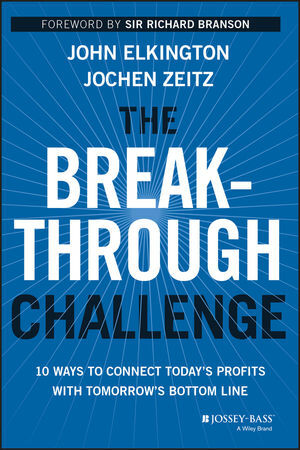 For more information, please visit www.thebreakthroughchallenge.com and follow the authors on Twitter via @VolansJohn and @JochenZeitz.